Last night, BBC political editor Nick Robinson’s report on the Ten O’Clock News took him to Grantham, where he called into the local Grantham Museum. Some footage was shown of the permanent exhibition about the town’s most famous living resident, but nothing of some of the other material on display there. This includes a unique collection of Dambuster artifacts, some sourced from the papers of the 617 Squadron’s founding Adjutant, Harry Humphries. 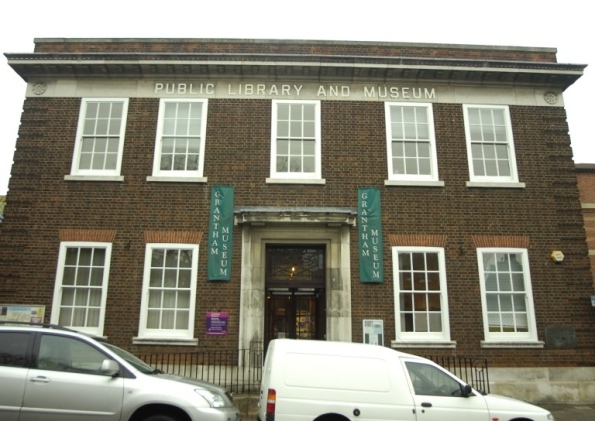 As Robinson mentioned during his film (which you can find on the BBC website) this museum is under threat of closure. Back in July, Lincolnshire County Council announced that it would save £90,000 by closing it and a small number of other local museums. This led to outrage in the town and a vigorous campaign has been waged locally. The museum may be saved if enough volunteers can be found to help, and enough political pressure is brought to bear on local councillors. If you live in Lincolnshire, please contact the campaign and add your voice. In the meantime, I have been told by local sources that if the museum is closed the collection will be put into safe storage, rather than being dispersed. This is some compensation, but no substitute for keeping such interesting material accessible to local people who have, after all, paid for it. I might be wrong, but I think this is the only original part of a Dambuster Lancaster on public display anywhere in the world. Eleven Lancasters got back from the original Operation Chastise but those that survived the rest of the war were all scrapped in the late 1940s. This bit of rusty twisted metal is the gunner’s mount and hatch from the rear of Lancaster ED825, which was flown by Joe McCarthy on the Dams Raid. Almost seven months later it was being piloted by Flt Lt George Weeden on an operation to send ammunition and supplies to the French resistance when it was shot down near Doulens in France. The story of its excavation, by a team which included Dams Raid expert Alex Bateman, was told in the Channel Five documentary, misleadingly titled The Last of the Dambusters, shown on British screens last year. Sqn Ldr George (Johnny) Johnson, bomb-aimer in McCarthy’s crew, accompanied the team on their journey. The hatch will join the other Dambuster exhibits – many of them from the collection of 617 Squadron adjutant Harry Humphries – on display at the Grantham Museum. Well worth a visit!